Is there anybody who still did not hear about nutritional values and amazing therapeutic properties of Broccoli (Brassica Oleracea or Brassica italica)? I do not think so. Usually, men do not like and do not eat this vegetable, since Broccoli is considered to be necessary for women as a natural remedy to prevent the development of breast cancer. However, broccoli, as a close relative of cauliflower, another real deposit of very useful natural elements and vitamins, is a real super food. It is one of the most useful vegetables which provides a range of unique nutritional and healing effects compatible with the effects of the most advanced modern medicines. Broccoli originates from Calabria, Italy, and its name comes from the Italian word “brachium” for “branch” or “arm“. It was very popular in the Roman Empire in the eighth-tenth centuries, and later on Italian immigrants brought this vegetable to American continent. However, soon European nations lost their interest in broccoli, and only after the World War I this vegetable was re-introduced in Europe. In the 1920s, the first commercial plantations of broccoli were launched in California. Since those times, broccoli remains one of the most favorite foods for every modern person, who takes care about own health and well-being. 100 grams of broccoli has 25 calories. This vegetable is a great natural source of dietary fiber, phosphorus, potassium, calcium, magnesium, iron, manganese, zinc, Vitamins C, B1, B2, B6, PP, E, K and A, folic acid and omega 3 fatty acid, tryptophan, beta-carotene and other important nutrients. In order to benefit from all those useful elements and all therapeutic values of broccoli, it is recommended to steam the sprouts or cook broccoli in a microwave oven. In contrast to usual boiling, these methods help to preserve the whole valuable nutrient content of this vegetable. In the researches publicized in American Journal of Epidemiology in 1999, it was mentioned that broccoli assists in reducing the risks of having coronary heart disease. 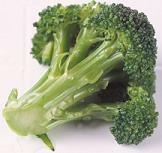 Broccoli stimulates and improves our immune system. Broccoli boosts cleansing abilities and speeds up detoxification processes in our body. Besides, it helps to prevent possible problems with liver, various infections and anemia. Natural components found in broccoli can effectively fight against the bacteria causing the infections in the stomach and peptic ulcers. Also, broccoli can assist in fighting with the symptoms of stresses. Finally, anti-cancerous and anti-aging effects are the most valuable properties of broccoli, as well as cabbage, cauliflower, the Brusels sprouts and other vegetables from Brassica family. In 1992, it was scientifically proven by the specialists from Johns Hopkins University that sulforaphane which can be found in broccoli is a very effective anti-cencer agent that stimulates production of phase II enzymes in the liver, which, in turn, can block the formation of cancerous cells and slow down the develpment of cancer: such type as lung, bladder, colon, prostate, ovarian and especially breast cancer. Therefore, it is essential for modern women to add these miraculous Brassica vegetables to their daily diet. This entry was posted 10 years, 1 month ago. Welcome to my site, I am glad that the information I post here is useful for you. I usually get it from books and scientific magazines, sometimes I ask suggestions from my tutors and the experts I know. Hi, Carla! I just by chance came across this site.. and I am actually so glad to go through all the information..